Despite the improvements in breast cancer brought about by endocrine therapy, their success clinically is limited by a significant number of patients which continue to acquire resistance and die of the disease. 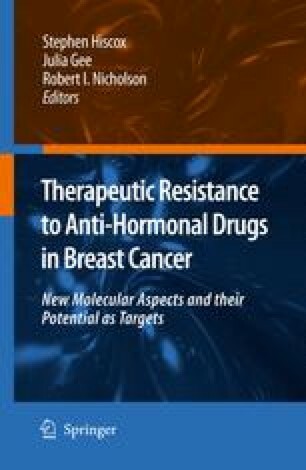 An increased understanding of the various biological mechanisms responsible for the development of endocrine resistance has identified new therapeutic targets, providing the rationale for combining signal transduction inhibitors with endocrine therapies to delay the emergence of acquired resistance and enhance the efficacy of current endocrine treatments. Although therapeutic targeting of mTOR, Ras activation and erbB family members alongside the ER have shown promise in pre-clinical models, clinical results have been disappointing, partly due to poor patient selection. The application of rigorous trial design and tumour selection criteria to future clinical trials may allow more accurate evaluation of intelligent combination therapies in breast cancer patients.